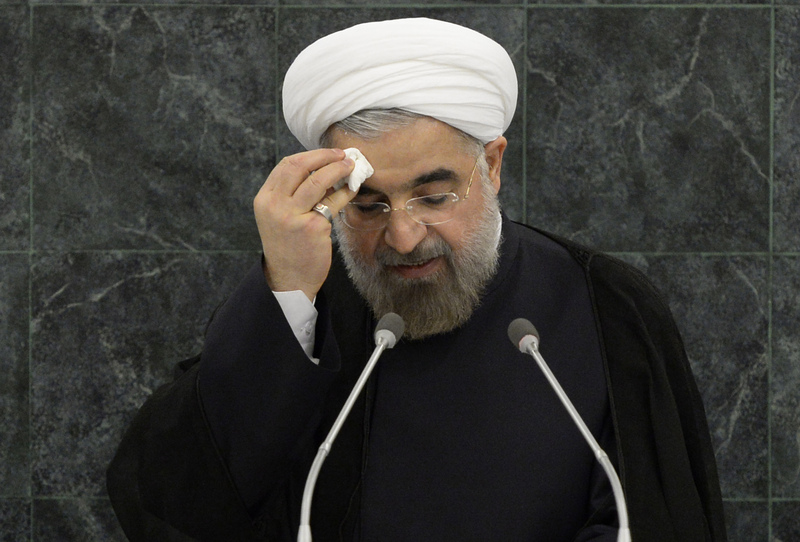 Rouhani and Obama Didn’t Meet—but That’s Okay! What matters is what’s happening behind the scenes in Iran, where there are other signs of progress. Despite rumblings of a historic meeting at the United Nations between the presidents of Iran and the United States, the two failed to cross paths yesterday in New York. The meeting would have been the first between presidents of the two countries since Iran’s Islamic Revolution in 1979. The official line from the U.S. was that the meetup was “too complicated” to arrange, but some have called the rebuff a blow to Iran’s cautious efforts at diplomacy that have been gathering momentum since Hassan Rouhani was elected this summer. But in fact, the move was probably a capitulation to forces back in Tehran: to move from minimal contact for more than three decades to a handshake or meeting at the highest level in so short a span is no small matter, and Iran's hardliners cannot be alienated if this diplomatic push is to succeed. The fact that Iran pulled back from the meeting while continuing to indicate its appetite for engagement might actually reveal a seriousness that Iran has not displayed in a long time. Rouhani did, after all, take the time to meet with France's Francois Hollande to discuss Syria, Lebanon, and Iran’s nuclear program, and he delivered a moderate speech that was a marked departure from his predecessor’s trademark spite and vitriol at the podium. Rouhani isn’t messing around. But while the spotlight is on the Iranian president in New York—CNN’s Christiane Amanpour called him “the ‘it’ man” of this UNGA—the most important political development in the Islamic Republic is not the election of an affable, well-connected, Scottish-educated moderate cleric with experience in nuclear negotiations; what matters is the silent shift behind the scenes that makes Rouhani’s rhetoric possible. None of these developments would have come to pass without a green light from the Supreme Leader, whose support for political reform and Western-friendly rhetoric is notoriously difficult to secure. His is the final word on political matters big and small, and Iranian presidents both progressive and fundamentalist have found their mandate undermined from on high when they fell from Ali Khamenei’s favor. But President Rouhani’s very presence in New York this week sends a very strong signal that Khamenei is willing to put his weight behind Rouhani’s diplomatic efforts, at least for now. The last three Iranian presidents have all at some point felt the Supreme Leader’s cold shoulder, at great cost to their political careers and agendas. Ali Akbar Hashemi Rafsanjani, who succeeded Khamenei as president when the latter was appointed Iran’s second Supreme Leader in 1989, was very close with Khamenei when he entered office. But during Rafsanjani’s eight years in office, their relationship began to deteriorate, in part because of differences over foreign policy. Their disagreement cost Rafsanjani dearly earlier this year when his name was struck from the presidential ballot. Ahmadinejad, elected in 2005 with Khamenei’s outspoken support, succumbed to a far more dramatic fall from grace during his second term in office. His misfortune came to a head when the Supreme Leader publicly reinstated a minister that the president had fired the very same day and escalated from there. Ahmadinejad was politically hobbled in the final years of his presidency, and his Chief of Staff and protégé, Esfandiar Rahim Mashaei, was disqualified from the 2013 election alongside Rafsanjani. But the president whose story most closely resembles Rouhani’s is Mohammad Khatami, a Reformist elected in 1997 to much domestic and international fanfare. Despite grand promises of liberalization and a high-minded Dialogue Among Civilizations, he quickly ran up against the limits of his office as Khamenei’s favor turned to resistance. Although Khatami was re-elected in 2001, gone was the hopeful mood that accompanied the beginning of his first term, when he won more than 70 percent of the vote. He found himself challenged at every turn by the Supreme Leader and his political apparatus, and whatever timid steps Iran took toward reform under Khatami were swiftly reversed after Ahmadinejad’s election in 2005. Khamenei’s support, though unpredictable and often self-interested, is the most basic requirement for a president’s success in pursuing any political agenda. And never before has Khamenei so directly voiced his tacit approval of engagement with the West as he did last week, when he spoke of “heroic flexibility” in front of a crowd of Revolutionary Guard commanders. “I am not against proper political moves in diplomacy,” he said. This is as far as the Supreme Leader will go to publicly endorse Rouhani’s rapprochement with the rest of the world: enough to convince the world that the president’s overtures are in earnest, but not so much that he is unable to reel Rouhani back in if he sees fit, and pin the failure of international engagement on the president. So when Rouhani writes into The Washington Post advertising his “broad, popular mandate,” he is recasting his message for an American audience. If a popular mandate were all it took to see reforms through Iran’s political system, Khatami’s first term would have transformed the country. Instead, Iran’s outward-facing president must curry the favor of the real decision-maker in Tehran in order to succeed. With the Supreme Leader’s seal of approval, Rouhani has more wiggle room than any other president in the history of the Islamic Republic. But to avoid the fates of his predecessors, all now defanged, he must balance his own ambitions against Khamenei’s. The moment the Rouhani loses the Supreme Leader’s support, this wave of reform will ebb as swiftly as it came. For this reason, Iran experts are watching for any indication that Rouhani’s pitch for diplomacy is being undermined from home. Yesterday’s failed meeting is not that signal. The decision to pull out of the meeting, when viewed alongside serious conversations with another Western leader, a reassuring speech in front of the General Assembly, and a candid interview on CNN, does not contradict Iran’s stated commitment to international engagement. If Iran’s overtures were nothing more than symbolic, an empty gesture like a photo op with Obama would have been a low-risk move. But Rouhani’s calculated, measured approach to a historic détente gives reason to hope that the Supreme Leader is, for now, still behind him.